Carson Wentz looks to throw to Eagles running back Wendell Smallwood in the third quarter. Identifying the worst thing about Sunday's 21-17 Eagles giveaway to the Carolina Panthers is a challenging task. But here is a contender: Overall, Carson Wentz is playing the best football of his career, certainly playing better than anyone has a right to expect, just 10 months after ACL and LCL surgery. And the Eagles keep finding ways to lose. The final numbers Sunday were 30 for 37 for 310 yards, two touchdowns, no interceptions, a 119.6 passer rating. The 81.1 completion percentage was a career high, as were the 15 straight completions. Try to imagine the 2017 Eagles losing a game in which their leader posted those numbers. Of course, they didn't. In fact, Wentz's numbers in all three of the 2018 losses he has helmed are better than in either of the games he lost in 2017, and in all but one of his nine rookie-season losses. >> READ MORE: How did the Eagles manage to blow a 17-point fourth-quarter lead? The view from the other sideline. It's true that Wentz didn't produce a game-winner on the final drive, after his defense found a shockingly easy way to blow a 17-0 fourth-quarter lead into a 21-17 deficit, when Wentz got the ball back at the Eagles' 30 with 1 minute, 17 seconds remaining. It would have been nice if he could have somehow managed that, when he got to fourth-and-2 from the Carolina 14 with 31 seconds left, after an Eric Reid interception on a miscommunication between Wentz and tight end Zach Ertz was ruled to have hit the ground. But all things considered, would a miracle touchdown at the end have drastically changed your perception of this team Monday morning? "I always say that he shouldn't feel like he has to carry this football team, but the reality is, he kind of is," Ertz said, after catching nine passes on 11 targets for 138 yards, his highest total since the 2016 season finale. "He's playing probably the best I've seen him play, coming off of injury, as well. It's really unbelievable what he's doing. But we've just got to make plays around him." Wentz does not have enough weapons, as was obvious from national network reports before the game that Howie Roseman is working hard to come up with a running back or receiver before the Oct. 30 trade deadline. >> READ MORE: Dexter McDougle joined the Eagles on Tuesday. He started on Sunday. 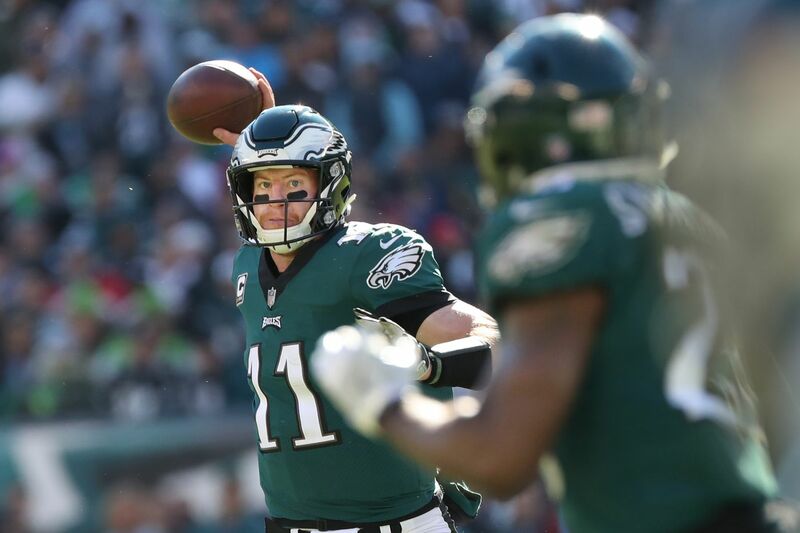 Wentz tried to force a ball to double-covered Alshon Jeffery on the third-and-2 play that preceded the fourth-down failure, in which Wentz was hit and fumbled, just as he saw Jeffery come free. Of Wentz's 310 passing yards, 226 were to Jeffery (seven catches, 88 yards and a touchdown) and Ertz. "That's just not a way for us to finish a game," Wentz said. He said that the Eagles moved the ball well early, that they "did some things well that we know we are capable of, and then it just seemed like we let off the gas as an offense, just stopped making plays." Lurking behind that feel-good 17-0 score going into the fourth was the fact that the Eagles should have had more points. They'd racked up 19 first downs at that juncture, 320 yards, 281 of them through the air. But a Brandon Brooks holding penalty negated a 51-yard gain on a Wendell Smallwood screen just before halftime. The Birds' second possession of the game ended with 62 yards gained and no points, when Wentz couldn't connect with Ertz on third-and-3 and Jake Elliott missed a 36-yard field goal, into a stiff wind. After driving for a touchdown on their first possession of the second half, the Eagles were at midfield on their next series, second-and-11, with a 17-6 lead, when Wentz flung a ball forward at a receiver's feet as he was being hauled down. Great, he avoided a costly grounding call; it would be third-and-11 now, not optimal, but far from impossible. Maybe the Eagles, three-for-three on fourth down, would get most of the yardage on the next play and then go for it again. But, wait: the officials were conferring. They decided Wentz was sacked, though no whistle blew before the throw. Suddenly, third-and-18. Wentz's pass to Jeffery netted nine yards. You don't go for fourth-and-9 when you're defending a lead. That was a tipping point for the offense, which went three-and-out on the next series, without trying a run, just a couple of piddly completed passes right around the line of scrimmage and then a longer incompletion, James Bradberry knocking the ball away from Jeffery. The play-calling late was suspect. In the second and third quarters, Wentz was dropping beautiful passes onto receivers' hands, down the sidelines and the seams. Those plays just disappeared, as did the runs. "We just broke down [on the three-and-out] and we can't have that," Eagles coach Doug Pederson. "Those are things that our guys pride themselves on. … I'll go back and look at the couple of play-calls there, and see if I can do a little better there, help our team there." Wentz was asked about working on closing out games. The Eagles' four losses have come by a combined 15 points. "I don't know how you work on closing out games, so to speak, in practice, but it's something that we have to do," Wentz said. "I thought it was something that we did well last year." Wentz and the Eagles travel to London next to face a 3-4 Jacksonville team that has underachieved as badly as they have. "We're going to find out what we're made of now, going forward," Wentz said. "I feel like we said that two weeks ago, saying it again. We're at make-or-break time, almost." They said it two weeks ago after losing to Minnesota at home and three weeks ago, after blowing a 17-3 third-quarter lead at Tennessee. What if they have found out what they are made of, and they just don't like the answer?